• Recently harvested crop maize, millet and paddy with its increment in production by 1.96% followed by 4.7% and 5.55% respectively and from market purchase, >50% of HH were able to keep the food stock for 5-6 months. • People are able to make a good earning from sale of orange, green vegetable (11000 HH and 155.448 million rupees), livestock and produce sale (around 1089 million of rupees), wage labor (17000 HH), and remittance (40% HH). Those have been the main strategy of livelihood in the district this cycle. • Market price of rice (sona mansuli) was found raised by nearly 11% comparing to last year same cycle but it was as similar as last cycle. 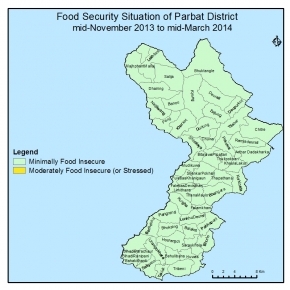 • No any kind of climatic hazards and disaster occurred in this monitoring period affecting food security situation of the district. • The situation of civil security was found generally peaceful however there was 10 days national strike called by political party right before CA election but the impact was ineffective. • People in the district with all the reason above were able to meet the basic food need in entire the reporting period. • The prevalence rate of acute malnutrition has continued to be 0.1% across the district. Current food security outlookThe food security situation is expected to remain same as previous cycle because the food stock in HH level and in market will be sufficient to meet the demand. Wage opportunity in public and private construction work will be created. Remittance will be regular. No significant cases of climatic hazards, disaster and disease epidemic is anticipated.